WASHINGTON — The year since Donald Trump's victory put Republicans in complete control of Washington has been a mixed bag for the president's and his party's agenda on Capitol Hill. Political parties wait years or even decades for that moment when everything lines up in their favor on both ends of Pennsylvania Avenue, and so far the White House doesn't have much to show for it. Trump and Republican lawmakers are running out of time to secure even one keystone achievement before campaigning ramps up early next year for the 2018 primary elections, when their Senate and House majorities will be on the line. "In a few years’ time, I hope people will say of the 115th Congress that we didn't just pay lip service, we made it a reality," House Speaker Paul Ryan said in his opening remarks to the House on its first day in session in January. Here's where things stand on Trump's agenda on Capitol Hill. Tax reform: Republicans are rushing to complete a tax overhaul, their — and the president's — last best hope for major legislation before the end of the year. The reception to the bill, unveiled last week, was mostly positive among the GOP, but major sticking points remain and Republicans have very little room for error. Judicial appointments: It goes beyond the approval of Supreme Court Justice Neil Gorsuch. With the recent confirmation of four conservative judges, the Senate is picking up the pace on judicial confirmations, helping to tilt the powerful federal bench increasingly in conservatives' direction after Barack Obama left plenty of vacancies to fill. Repealing regulations: Republican lawmakers had great success in undoing regulations passed in the waning days of the Obama administration on everything from the environment to guns to education. GOP lawmakers are still effectively using their authority to kill regulations they and the White House don't like. Last month, Vice President Mike Pence broke the tie on a bill that nixes a Consumer Finance Protection Bureau rule making it easier for people to sue their banks. Obamacare repeal: Repealing the Affordable Care Act has been the GOP's top priority for the better part of a decade, but after spending most of the year working on it — they got started before Trump was even sworn into office — Republicans failed when three of their own in the Senate killed the repeal and replace plan in a dramatic late-night vote. The issue is sure to come back up again, but it's dead for now. The Wall: No progress has been made on Capitol Hill on one of Trump's signature campaign promises. While the Department of Homeland Security recently oversaw the construction of several prototype walls, Congress has yet to allocate any money for it and Republican leaders don’t seem eager to make a stand on the issue in coming spending fights. 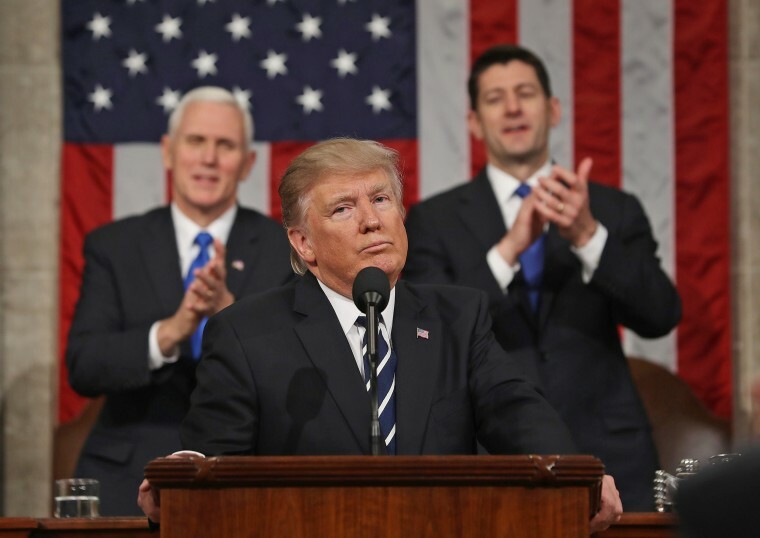 Legal immigration: Trump has taken executive action to limit legal immigration, but a proposed congressional overhaul of the visa system has gone nowhere. Illegal Immigration: Lawmakers have debated what to do about young immigrants covered by the DACA program that Trump recently curbed, but they've yet to pass anything. There's some hope for action by the end of the year, but lawmakers have sent mixed signals. And they haven't spent much time working on bigger questions about undocumented immigration that have long flummoxed Congress. Infrastructure: Trump ran on a promise to move quickly to spend $1 trillion on a massive infrastructure plan that would create jobs and repair America's failing bridges, roads and airports. But after some initial chatter about the idea, infrastructure seems to have fallen off the agenda for both lawmakers and the White House. Defund Planned Parenthood: Another long-time priority of social conservatives that has come close, but not close enough, several times, leaving anti-abortion groups fuming. Regular order: When they were in the minority, Republican lawmakers complained bitterly that Democrats abused their power by ramming bills through Congress, circumventing the traditional rules that offer time for debate, hearings, amendments and input from lawmakers of both parties. “I pledged to restore regular order," Ryan said in his opening remarks in January. It turned out to be easier said than done as Republicans ran up against the clock in trying to pass their owns bills. And there could be consequences. Sen. John McCain, R-Ariz., for instance, said he would vote against an Obamacare repeal bill that didn't go through regular order. He made good on that threat, and now he's issued a similar demand for the tax reform plan.